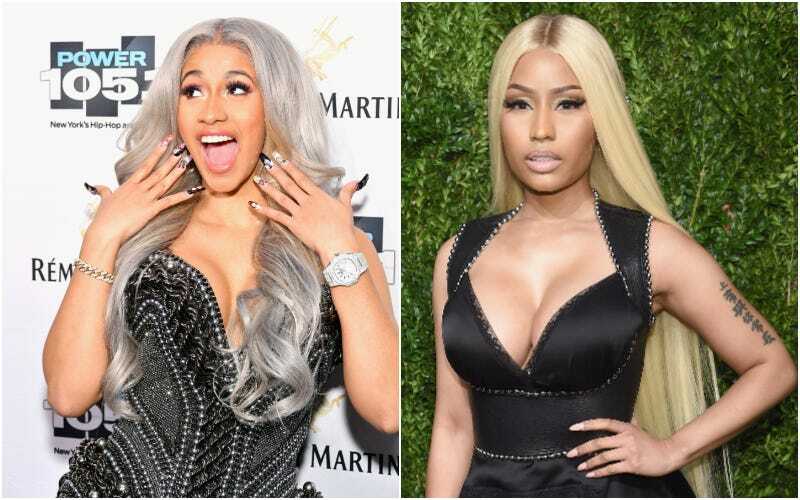 The notion that Cardi B and Nicki Minaj dislike each other has long felt like the sort of fan speculation typically saved for prestige cable dramas—a notion that, surely, two famous and well-liked female rappers must eventually be pitted against each other, because the world’s most popular genre of music can only contain one woman at a time. Both have, by and large, disavowed this narrative as frequently as possible, tweeting praise for each other and playing down the supposed beef when asked about it. Rap beefs can be great fun, but it was nice to think that this one wouldn’t happen, that two big, brash personalities like theirs could peacefully coexist, leaving the sniping and comparisons for, like, Twitter. The only thing with Cardi that really, really, really hurt my feelings was the first interview she did after ‘MotorSport’ came out. I remember when I first came in the game, if a female of that stature had done a feature with me on it, I would only be singing their praises and saying, ‘Thank you.’ The first interview she did after ‘MotorSport’ came out, it just really hurt me, ’cause she looked so aggravated and angry. And the only thing she kept saying was saying was ‘Oh, I didn’t hear that, I didn’t hear that verse.’ I was like ‘What?’... Her most recent interview, Cardi, that’s when I just came back on Instagram, and I saw it and I felt good. I finally felt like she said something genuinely nice about me. Later, she says she felt like Quavo from the Migos wasn’t backing her up properly, especially when she and Cardi didn’t appear in the video alongside each other. This controversy only came about because of scheduling conflicts with their shared hairstylist, but the Cardi-Migos interviews constituted something of a conspiracy to make Minaj look like the “bad guy,” in her telling. Whether or not this name-drop or any of the other supposed insults that have been flung between the two are in fact direct insults to the other, of course, is totally open for debate. The “Motorsport” verses (and the handful of other tracks in which the two seem to address each other) are all so nebulous as to be about anyone. The only real difference is that Minaj celebrated #NickiDay by making it explicit, a turning point leading to a bunch of speculative articles (like this one) and casting all of their ensuing, nebulous diss tracks in a new light. It’s mutually assured promotion, a fan theory come to life. I see all these guys coming out at the same time and most of them actually do sound alike. Sometimes I be like, ‘Who is this?...Isn’t that so-and-so?’ It’s like, why you don’t do that to them? Why it gotta be girls? Every rapper right now, like Nicki, Remy, me, some girls that’s on the come-up, it’s like, I don’t feel like nobody sound like each other. This is extremely true! In that spirit, here are the new Nicki Minaj singles, which are both good and fun and not very similar to the also good and fun new Cardi B record. You can listen to all of those things if you want!